Median Line Analytics is very important for helping to decipher trends. Using the Elliott Wave Principle, trends in any timeframe are generally caused by impulse waves (the most common type of motive wave). Impulse waves unfold in swings of 5, 9, 13, 17, 21, etc. Corrections unfold in swings of 3, 7, 11, 15, 19, 23, etc. Some corrections become complex and link together and appear to be in trends. In this case, the significant pivots will be overlapping and the behavior will be quite different from a strong tradeable impulse wave. Corrective structures incorporate motive waves like a “C” wave in a flat, or zigzag. It is not uncommon for the context of these “C” waves to be mistaken by traders. The simplest way to think tradeable moves in price is to look for 5 swings to complete on significant pivots in the timeframe under consideration. These are impulse waves, (which are a type of motive wave). The first swing is P0 to P1, the second, P1 to P2, etc., and the fifth is from P4 to P5. 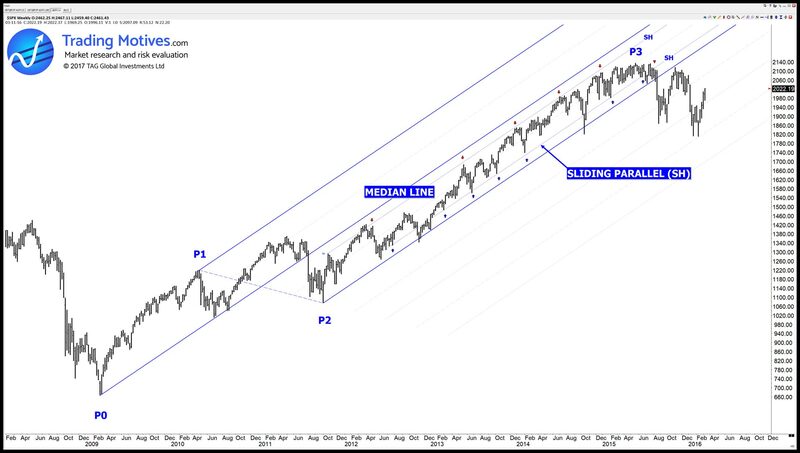 For trends, an initial Median Line is drawn on P0-P1-P2. 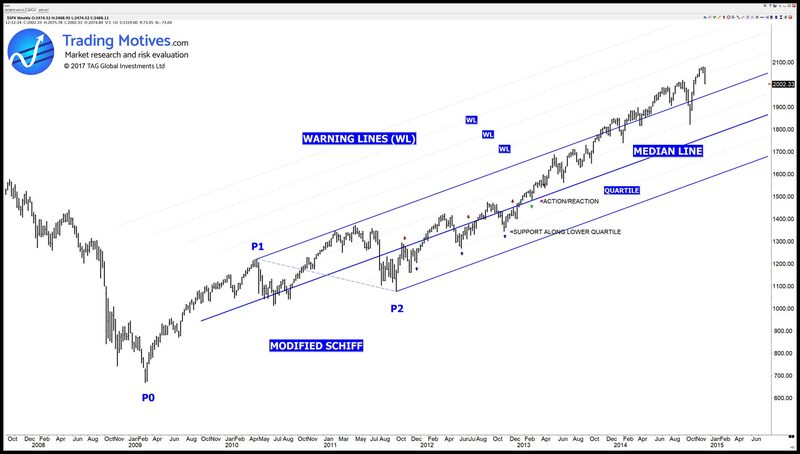 The trend on the timeframe is complete when P5 is complete. TradingMotives uses Fibonacci retracements and Median Line Analytics on the first retracement that is created after a significant top, or bottom on the timeframe being considered. This process helps to find P2 using P0 and P1. Once P2 is complete, it creates the last significant pivot necessary for the median line to be applied to help find pivot P3. Look for validations to the ML selected as price unfolds in real time. Change the type of Median Line (Normal, Modified Schiff, or Schiff) as necessary and use the one that “fits” price the best. 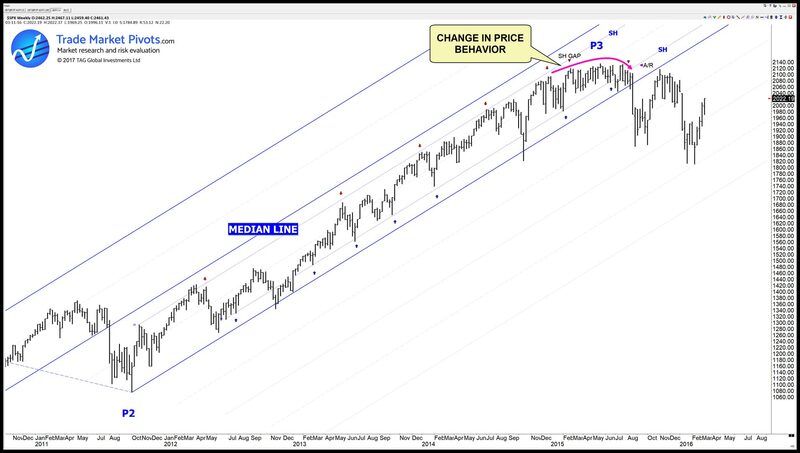 In these chart examples, Median Line Analytics is applied to a bullish up-trend. The analytics works in an opposite way for bearish down-trends. Price rose quite strongly after P2 and a modified Schiff was chosen initially. Note the support from small corrections along the lower quartile (blue arrows). This price action helps to validate the modified Schiff and it is typical in strong trends for price to break up through the Median Line on a modified Schiff (and a Schiff) and retest on it before resuming the trend (see label “ACTION/REACTION”). Strong trends can also breach the upper parallel (as shown) and this is when the warning lines become useful to monitor action/reaction. A single modified Schiff (or Schiff) applied to P0-P1-P2 can be used to help find P3, P4 and P5 with the use of sliding parallels to monitor changes of price behavior that occur as new pivots are formed. As an alternative, when P3 is complete, look for P4 to develop (using similar techniques for finding P2). 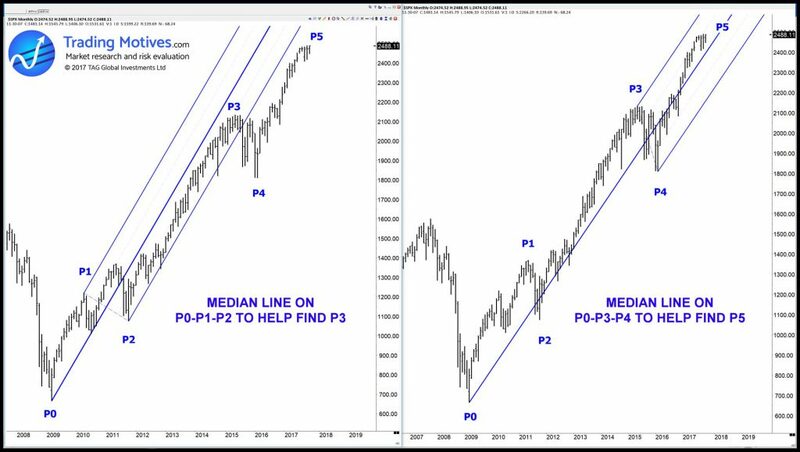 When it is complete, apply a new median line to P0-P3-P4 to help find P5, as illustrated in this chart. 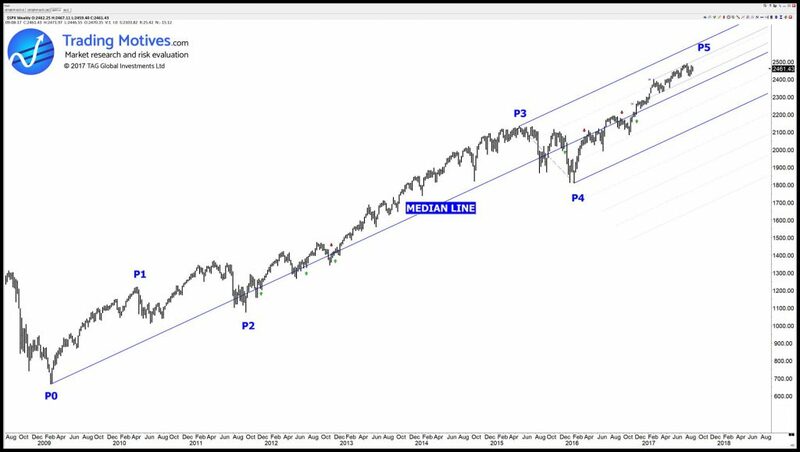 The key issue is to look for validations along any median line that is applied. More validations increase the significance and relevance of the median line and this also applies to sliding parallels. This, in turn, validates the Median Line Analytics. Sliding parallels (SH’s) can be applied to price in locations where there are obvious actions and reactions and these are used to help validate the Median Line and to define anticipated support and resistance levels as price unfolds in real time. Sometimes these sliding parallels start from internal pivots (between the significant pivots) and sometimes they start from the beginning or end of long range bars, or gaps. The example illustrates how the sliding parallels can be applied and used to monitor price behaviour. Note the repetitive support along the lower SH (blue arrows) and the repetitive resistance along the upper SH (red arrows). This is also referred to as “action and reaction”. Frequent occurrences strengthen the validity of the Median Line. In this example, two sliding parallels gave important information about support and resistance levels for more than 3 years. Median Line Analytics gives important information about changes in price behavior which generally precedes either a correction, or change in trend. As price approached a top (P3) the new highs failed to reach the upper sliding parallel and the gap increased. This constitutes a change in behavior and warned that P3 was approaching. Once P3 completed, price then breached the lower sliding parallel and “zoomed” down through the lower median line parallel. A “zoom” describes a strong move through a median line or a parallel. When these breaches occur, there is often an attempt to retest the break during a retracement as shown in the example. The first retracement retested close to the lower parallel. This median line was very effective to help find P3. In a motive wave (trend) look for the completion of the correction that evolves from P3 and label the new pivot as P4. Once P4 is defined, a new median line can then be applied to pivots P0-P3-P4 to help find P5. P5 has not completed in this example, but there is valuable information to monitor changes in price behavior to help determine when it might complete and have applied two sliding parallels to monitor that process.